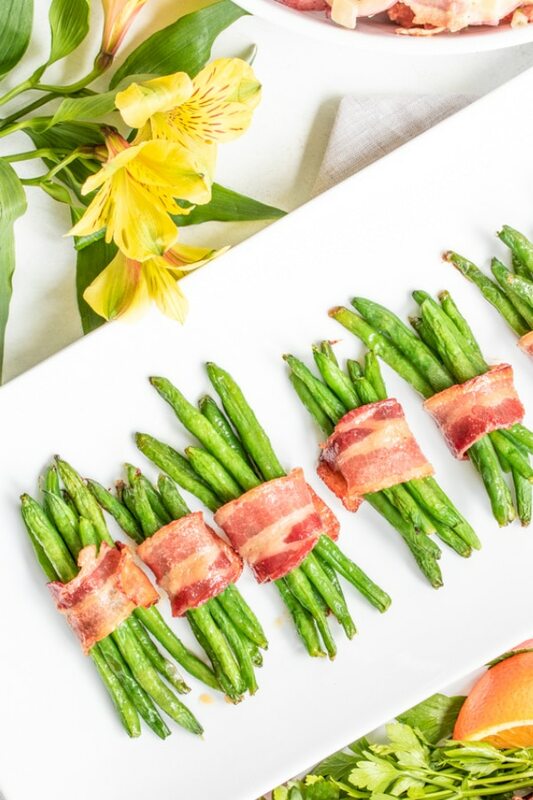 Bacon Wrapped Green Beans - Home. Made. Interest. 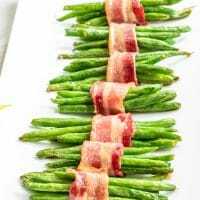 These Bacon Wrapped Green Beans are an easy side dish made with roasted green beans, bacon, and brown sugar. They make a great addition to holiday dinners! 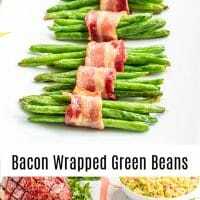 Bacon Wrapped Greens Beans are one of those fun side dishes that look really impressive when you serve them, but are actually really simple to make! 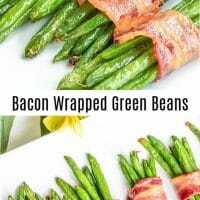 Green bean bundles have been around forever and this classic side dish recipe couldn’t be any easier to make. 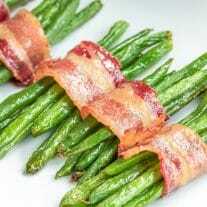 Oven roasted green beans, wrapped in crispy bacon, and coated in a delicious brown sugar glaze go perfectly with Honey Glazed Ham and make a great addition to Easter dinner or Christmas dinner. Cook 10 pieces of bacon until they are starting to crisp but are still flexible. Set finished bacon on a paper towel-lined plate to remove excess grease. Par cook the green beans boiling them for 4 minutes. Remove from boiling water and run under cold water to stop the cooking process. Pat dry. 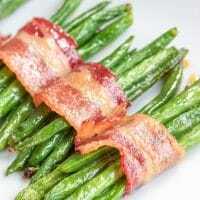 Wrap each bundle in a half slice of bacon using a toothpick to hold the bacon around the green bean bundle. In a small bowl mix together melted butter, brown sugar, and garlic powder. Brush each green bean bundle with the brown sugar glaze. Bake for 7 minutes or until the bacon is crisp. 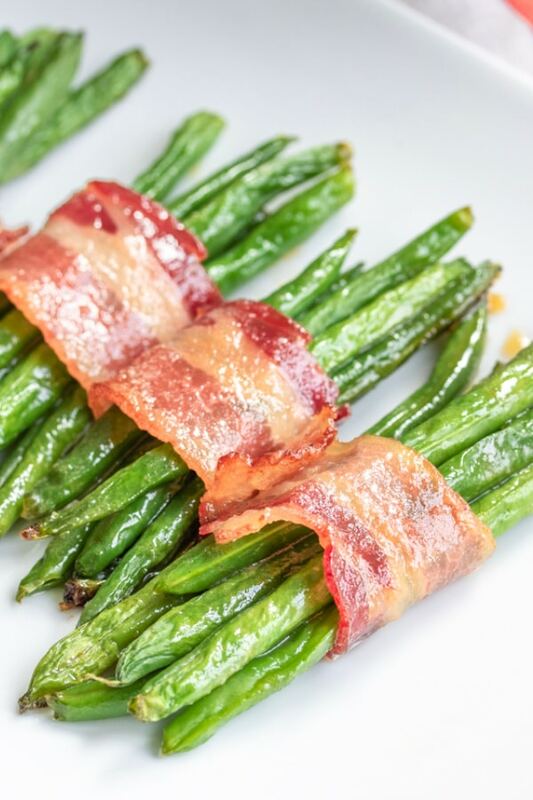 When the green bean bundles come out of the oven the green beans are perfectly roasted, with a delicious brown sugar glaze that coats the green beans and bacon. 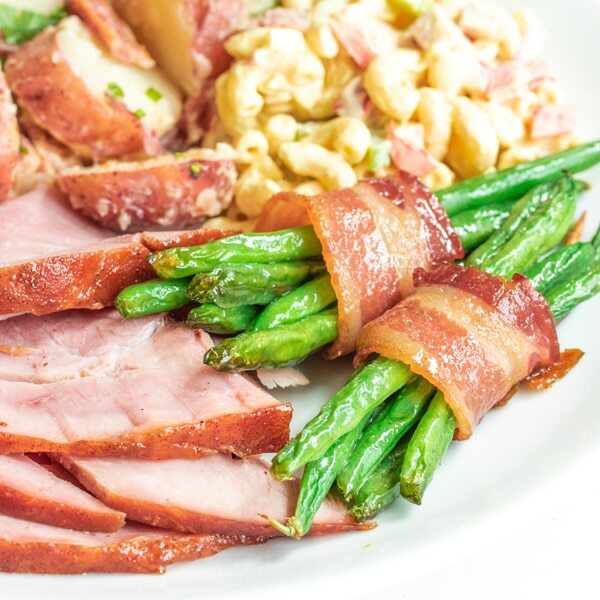 Each bundle is an impressive individual serving of green beans and a mix of salty, smokey, sweet bacon that your guests are going to love! Like this recipe? Pin it to your Side Dish board! Wrap each bundle in a half slice of bacon using a toothpick to hold the bacon around the green bean bundle. You may have extra bacon depending on how many green bean bundles you can make.